This is an amazing corpus, and I think it throws important light on both the theory and the history. It is historical sociology on a macro-scale; and yet Mann also provides careful, almost ethnographic details at the level of individual actors -- fascists, ethnic paramilitaries, legislators, colonial administrators. So I think Mann also offers a great example of a sociologist who is not prisoner to a single methodology or a single avenue of approach to these supremely complex social processes. Another admirable dimension of Mann's approach to this long sweep of history is his insistence on the contingency and conjunctural character of that history. Mann doesn't try to reduce any of the periods he considers to a simple organizing theme -- "modernization," "colonialism," "resistance." Instead, he recognizes the degree to which the historical process is heterogeneous across space and time. Fascism had different dynamics in Spain than in Germany; and both were distinct from the fascist ideologies of France between the wars. But this recognition of the contingency of historical processes does not mean that explanation and generalization are impossible. 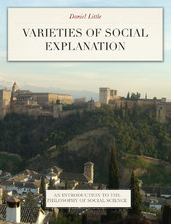 Instead, Mann takes an approach that is familiar from the social mechanisms approach, though on a more macro scale: he looks to trace causal mechanisms and sequences to show how various social structures and circumstances led to specific kinds of changes in the social order. Empire and globalization are central topics in the final two volumes of the work. This reflects Mann's historical judgment that the past century or so has been structured by the internationalizing pressures of economic and military interest to create broader systems of control. I'm looking forward to reading these final two volumes carefully. 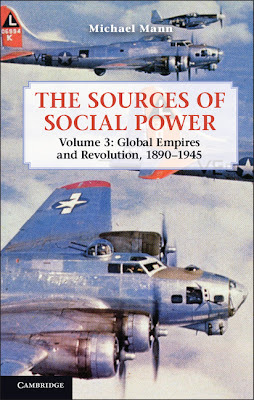 In the meantime, though, I'm struck by an interesting parallel between Mann's approach to this set of histories and that offered by Eric Hobsbawm a generation earlier. Hobsbawm was not a sociological theorist. But he was responsive to many of the same large issues as those raised by Mann: class, capitalism, state, colonialism, revolution, and war. And certainly Hobsbawm no less than Mann was very clear about the role that social power played throughout this global history. One other observation that strikes me in looking through the four volumes as a group is that the books do not give much spotlight to Asia. The Japanese empire is a central topic, and the Chinese Revolution comes in for some attention. But a key insight that historians of Eurasia like Bin Wong, Ken Pomeranz, and Prasannan Parthasarathi have arrived at, is that Asian history and politics need to be considered in their own terms. The institutions, politics, and ideologies of India, China, Burma, or Japan are not just pale versions of European equivalents; rather, they have their own logics and historical distinctiveness. So as large as this four-volume corpus is, it is still importantly incomplete. And it is a very interesting question to consider whether the IEMP framework that Mann develops works well as a basis for understanding the major turns of historical development in India or China over a comparable sweep of time.
" From then on India, China, Islam, and Europe went different ways. Global comparative sociology-always difficult in my view- now becomes too difficult. From now on I chronicle only one case, Christian Europe and its offshoots"
What is "critical" about critical realism?